The 485OPDR-HS is a high speed, optically isolated RS-422/485 repeater that supports data rates up to 1.5 Mbps, making it suitable for use in fieldbus systems such as Profibus. It provides 2 kV digital isolation with 8 kV air ESD protection and 600 W transient voltage suppression on the data lines. The 485OPDR-HS can be used to extend the range of a network up to 4000 ft. (1.2 km), depending on data rates, and to add additional nodes. 2-Wire RS-485, 4-Wire RS-485 and RS-422 are supported. Data signals and the power inputs connect to built-in terminal blocks. The repeater operates on externally sourced 10 to 30 VDC power. 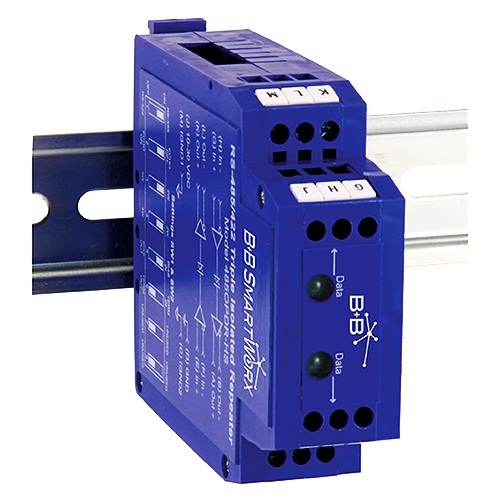 The enclosure has a DIN rail mount that is designed to fit easily on a standard 35mm rail. The 485OPDR-HS is ideal for your critical industrial communications needs.